WOW Air has dropped the price of their late 2017 and early 2018 flights from Toronto to Tel Aviv, Israel down to $347 CAD roundtrip (without luggage) to $527 CAD roundtrip (with luggage). However, to book these flights requires booking 2 separate one way tickets, and requires booking the Tel Aviv to Toronto ticket in $USD. Click on the departure date box to open up the calendar view and browse for the $200 CAD dates. 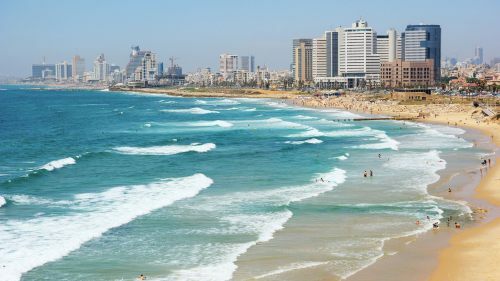 These are ONE WAY flights from Toronto to Tel Aviv for $199 CAD. Click on the departure date box to open up the calendar view and browse for the $147 CAD dates. However, when you click through to the WOW Air website, you'll notice the price jumps up to $350 CAD. BUT, if you edit the URL of the WOW Air search result and change it from CAD to USD, and reload the page, it will show up as $120 USD, which is around $148 CAD. 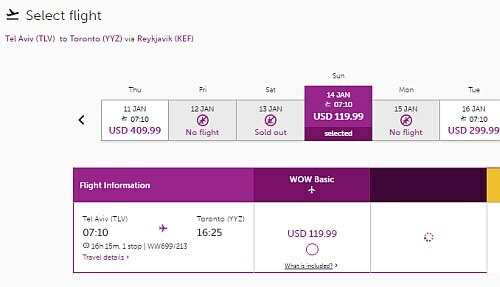 The other way you can book the Tel Aviv to Toronto flight for $120 USD (which might be easier) is to just go to the U.S. version of the WOW Air website and try the same date you found on Google Flights. WARNING: Booking the flights this way requires booking two separate one way tickets. The risk is that if you book one ticket and the other ticket you want to purchase sells out in the mean time, you may be out of luck. So proceed carefully. Update 12/14 - While not quite as cheap as when they dropped in the fall, WOW Air is showing January and early February 2018 flights from Toronto to Tel Aviv, Israel for $399 (carry on only) to $579 (checked luggage) roundtrip including taxes. 2 Responses to "Toronto to Tel Aviv, Israel - $347 CAD roundtrip (without luggage) to $527 CAD roundtrip (with luggage)"
It worked! Booked for 10 days to Israel in March! Thanks so much. Didn't add bags to booking, still deciding if I want to take a checked bag or not. Thankfully have until departure to decide. CAD 347 to TA and back, amazing deal!